Disney has three new blu-ray releases of Studio Ghibli films: Pom Poko, Porco Rosso, and Tales from Earthsea. I've seen all the films before, but this is the first time I've seen them in high-definition. They all looked great on DVD, though that doesn't necessarily mean they'll still look great after being converted to high-def. But then this is Disney and Studio Ghibli so of course the blu-ray looks fantastic! All three releases contain both the original Japanese audio track and the dubbed Disney dialog track with well known top-of-the-line actors. And they all contain both a blu-ray and a DVD so they can be enjoyed in all the places you don't yet have a blu-ray player. Porco Rosso was the second of these three titles that I watched. Hayao Miyazaki's movies usually have a strong environmental message, but Porco Rosso is one of those rare exceptions, instead being about a person's independence and freedom, and regrets. Porco is a seaplane pilot who has been cursed with the head of a pig. He used to be a World War I pilot but has since turned to bounty hunting. We first get to see Porco's talents when he rescues a bunch of children from a band of seaplane pirates called the Mama Aiuto Gang, but Porco's true antagonist of the film is a dashing and talented American pilot named Curtis who endeavors to become a Hollywood star and President of the United States. When Porco is shot down by Curtis, he must track down Piccolo, his mechanic, in Italy to have his one-of-a-kind plane repaired, even though Porco happens to be a wanted man (or pig) in Italy for deserting the air force. Once at Piccolo's he finds that Piccolo's 17 year old granddaughter Fio has taken over the mechanic duties. He's hesitant at first, but eventually the two form a bond and flee the city for Porco's hiding spot. It's there that they once again encounter Mama Aiuto Gang, and soon after Curtis which culminates in a final showdown between the two ace pilots. Despite the fact that our protagonist is an anthropomorphic pig, this is one of Hayao Miyazaki's most realistic films. There are no spirit creatures or weird fantasy lands, everything feels like it could have really happened. While it's rated PG and has nothing really objectionable for viewing by children, I think kids may find it not as interesting as adults just due to the adult themes. Take flight with “Porco Rosso,” a valiant World War I flying ace! From tropical Adriatic settings to dazzling aerial maneuvers, this action-adventure from world-renowned animator Hayao Miyazaki is full of humor, courage and chivalry. When “Porco”—whose face has been transformed into that of a pig by a mysterious spell—infuriates a band of sky pirates with his aerial heroics, the pirates hire Curtis, a rival pilot, to get rid of him. On the ground, the two pilots compete for the affections of the beautiful Gina. But it’s in the air where the true battles are waged. Will our hero be victorious? 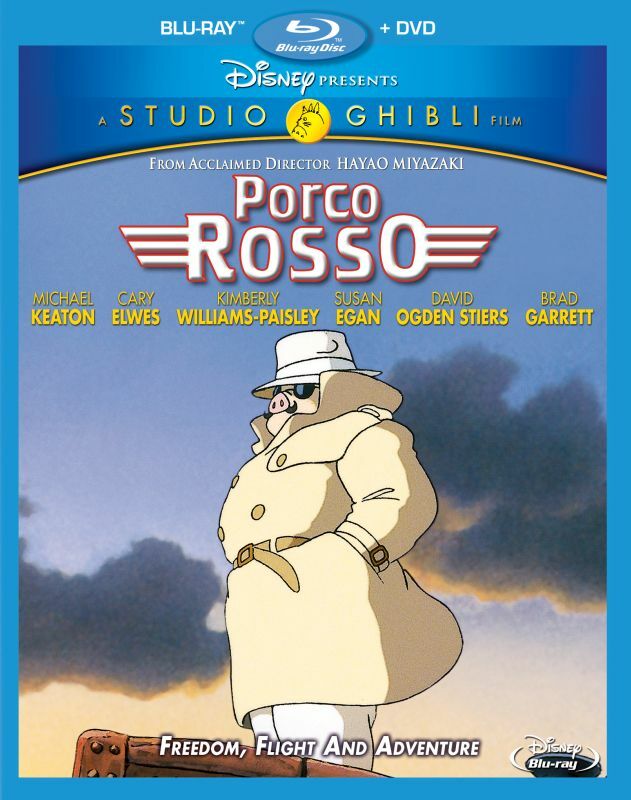 For the first time ever on Disney Blu-ray, “Porco Rosso” is a thrilling ride you’ll never forget!